Many different kinds of bears populate the wilderness. Unless you know the exact geographical location of a kind of bear sub-species, you probably do not know how to differentiate bear tracks from one another. This can be especially unnerving if you are in the wilderness and come across a suspiciously large paw print. Assuming you do not know the types of bears in the region, you might want to know how to tell one track from the next. Measure the rough size of the track. Depending on the type of bear, the track will vary in size. For instance, a grizzly bear leaves a deeper and larger track than a black bear. If the track is about 5 inches by 5 inches, you are looking at a black bear’s front paw track. If the track is 5 inches wide by 7 inches long, it is more likely to be the back paw of a black bear. A grizzly bear’s track will be closer to 5 inches wide by 7 inches long for the front paw and about 6 inches wide by 11 inches long for the back paw. The size of the track can tell you a lot. Measure the approximate depth of the track. Because a bear’s paw is padded, the tracks are almost always deceptively smaller than the actual paw. However, by looking at the depth of the print, you can get a rough idea of what kind of bear it is. A deeper print is more likely to be a grizzly bear because they will weigh more than a black bear. Look at the claw marks. The claws of a black bear will be thicker and shorter, which will leave prints to indicate this. 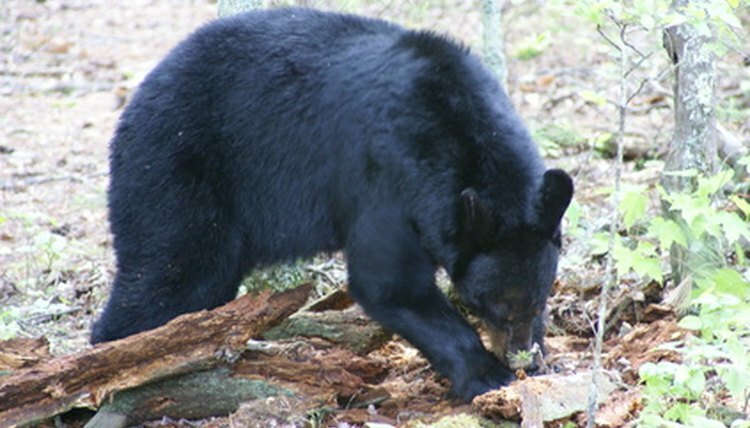 A black bear has stronger claws that are more likely to bury into the ground vertically because of their curve. Grizzly bears, on the other hand, have longer, thinner claws and will more likely be straighter in their indentations. The claws print can easily differentiate the bears.